Chengdus & Don'ts: Rock, Rock Til You Drop! This morning after breakfast Jonny went downstairs with the kids and decided they would have a little rock band practice to some Def Leppard. Jonny kept yelling at me to come downstairs to see what they were up to. This is what I found! 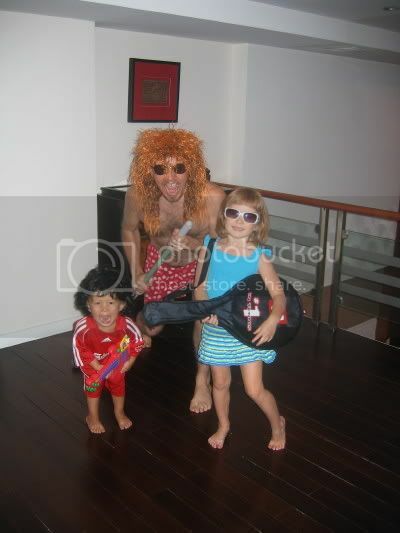 Yes, that is Jonny in his underwear with his new wig and Angus in his sister's Liverpool kit with Jonny's old wig! I thought this picture was too funny not to share! That is such a cute and funny picture! I can almost hear "Pour some sugar on me"!! Hilarious! I also can hear "Pour some sugar on me!"